If someone told you that your whole world was limited to a small cup of water and that you'd been essentially shelved behind other betta fish that are in better shape than you, you'd probably fall apart. Well, that's exactly how one betta fish felt when it seemed like no one in the world was left to really care about him. To add insult to injury, he started to look as bad as he felt emotionally and was practically dissolving before no one's eyes, because no one was looking. It seemed like a sure thing that he was going to go belly up any day now, but then, a human walked into Walmart, noticed him and changed his life when he took him in. Not long ago, this betta fish was circling a small cup and he had no one around to love him. He was placed in some remote corner while Walmart employees placed his healthier looking brethren at the front so customers would buy them. Naturally, he felt like he had been abandoned by humanity and was starting to disintegrate. 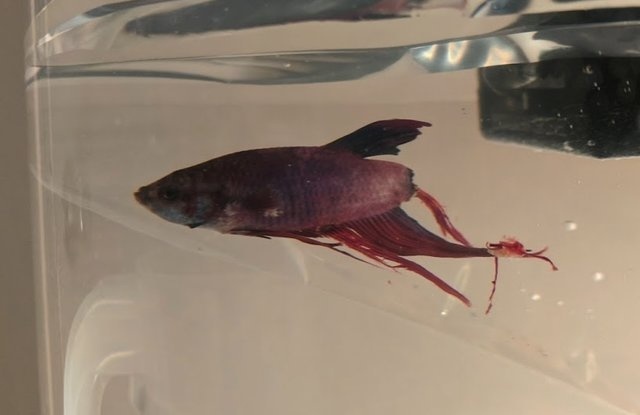 The betta fish wasn't doing so hot and it showed throughout his entire body, and he was getting worse. His color had started to fade and parts of him were actually starting to rot and fall off. Naturally, the fish would just swim towards the bottom as if he was resigned to his fate that his soul would be swimming in that big ocean in the sky. The fish had just about given up on life when someone with a heart walked into his life. When Victoria Schild walked into Walmart, she hadn't planned to buy a fish or any pet for that matter. But then she saw the poor betta fish in the worst condition ever her heart went out to him. When Schild lifted the cup to get a closer look, she noticed that some of his tail was floating to the top. She felt horribly sad for the fish and then realized that he would probably die that same night if she didn't help him out. Unwilling to let him rot away, she decided to adopt him and give him a new lease on life. Schild provided the betta fish with some comfort by placing him a bigger tank that she already had at home. She was certain that the fish would die anyway. Despite her initial fears, she didn't give up trying, and eventually, his condition began showing signs of gradual improvement. The fish slowly started to explore his new surroundings.